What Weight Dumbbells Should I Use to Tone My Arms? One of the most common questions I get (especially from women) is what weight dumbbells they should use to tone their arms. Basically, they want those lean celebrity-style arms and not bulky bodybuilder arms. If you want a quick answer, jump to this part. I hear you about wanting to lose the arm jiggle. But this question is based on a prevalent myth that heavy weights = bulking and lighter weights = toning. Yes, MYTH! Neither heavier nor lighter dumbbells will tone your arms. Here’s why. Lifting Weights Won’t Make You Look Like a Monster! 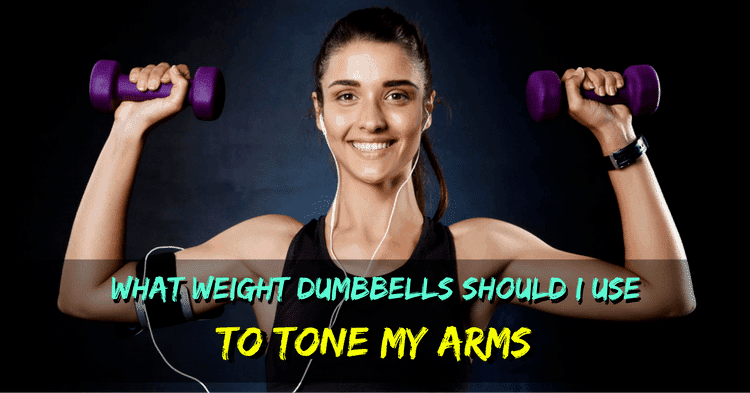 Which Weight Dumbbells to Choose for Arm Toning? Tone: To have some amount of muscle on your body AND low enough body fat percentage that you can actually see the muscle. You can have huge muscles but, if they are covered by lots of body fat, you won’t look tone or even bulked. On the opposite end of the spectrum, you can have virtually zero body fat. If your muscles aren’t developed, you won’t see muscle definition through your skin. Most people asking me about dumbbell weight for toning need to do both – lose arm fat and build muscle. One of the major reasons that many women never hit the weights is because they are worried they will end up looking like a monster with giant muscles. I assure you that it takes a LOT of work to get that amount of muscle definition. Professional bodybuilders spend between 1.5 to 3 hours in the gym per day. I doubt you are spending that much time in your gym actively working out. Simply lifting weights – even heavy ones – is not going to make you look like a monster. Rather, lifting weights is going to give you a lot of health benefits that go beyond a stellar-looking physique. When it comes to lifting weights, there is some difference between lifting light and heavy. Lighter weights for more reps will increase muscular endurance whereas heavier weights for fewer reps will increase strength. But this has NOTHING to do with toning! There are numerous studies to back this up, such as the study mentioned here which found that subjects who lifted lighter weights added as much muscle as those lifting heavier weights. Contrary to the entire “lift light” myth, there are actually several reasons why you’d want to choose heavier weights for toning your arms (or any other body part). To build muscle, it doesn’t matter whether you use light or heavier weights. What does matter is that you are fatiguing your muscles. Simplified, muscle fatigue means your muscles are being challenged (don’t confuse muscle fatigue with muscle failure – training to failure isn’t always beneficial!). According to the American Council on Exercise, muscle fatigue should set in within 1-2 sets of 8-15 reps. Jessica Matthews, MS, E-RYT, says that muscle fatigue needs to set in within 90 seconds of starting an exercise. You won’t be able to achieve muscle fatigue with very light dumbbells, which means you won’t get results! Test your limits by using light dumbbells. If your muscles aren’t tired quickly, then increase the weight! Remember how we said that toning requires you to increase muscle mass AND reduce fat? Well, lifting heavy dumbbells is going to do that better. A lot of people believe that cardio is the best way to lose fat. However, numerous studies actually show that cardio does little for losing weight. This is because cardio only burns calories while you are actually doing it. After you stop the cardio, the fat-burning stops too. By contrast, lifting heavy weights causes Excess Post-Exercise Oxygen Consumption (EPOC). Simplified, this means that your body burns fat and calories to repair your muscle tissues. Numerous studies show that lifting heavy weights burns calories for up to 38 hours AFTER you finish working out! Finally, I tell clients who want to tone their arms to lift heavier dumbbells because it is more time efficient. Sure, you could do a whole bunch of reps with lower weights – but who has time for that when you can get the same effect from lifting heavier dumbbells for fewer reps? Some muscles in your arms are stronger than others. When doing exercises which work these muscles, you should choose heavier weights. Here is a good guide for beginners on which weight dumbbells to choose. Once you can do the arm toning exercises at these weights easily for 12 reps, increase to heavier weights! Does Pre-Workout Make You Gain Weight? Hi! I'm Carla - a personal trainer, kickboxer and fitness nerd. I believe that everyone should be able to stay fit, even if they can't afford a gym membership. That's why I volunteer with inner-city youth programs and share training advice online.